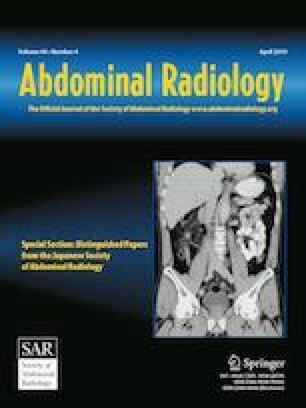 This study examined radiological imaging features of small (≤ 3 cm) and large (> 3 cm) adenosquamous carcinomas of the pancreas (PASC) lesions to better understand the morphology of these lesions. Images from 110 patients with pathologically proven PASC (80 males and 30 females, mean age: 62.6 years) were retrospectively reviewed. Two radiologists analyzed images and reached a consensus regarding the following features: location, shape, margins, presence of solid and necrotic components, rim enhancement, density/intensity during the portal venous phase, invasion of surrounding organs, vascular invasion, venous tumor thrombus formation, and enlarged lymph nodes. Differences in the imaging features between the two groups were evaluated with the Chi-square test or Fisher’s exact test. There were 41 small PASC lesions (mean age: 60.59 years) and 69 large PASC lesions (63.74 years). Statistical analysis demonstrated significant differences in the location, shape, adjacent organ and vessel invasion, and venous tumor thrombus formation (P < 0.05). Small PASC lesions were more frequently detected in the pancreatic head and had an ovoid shape. There was no significant difference in the presence of solid and necrotic components (P = 0.090), including approximately 3/4 of the lesions with necrosis and 1/4 purely solid lesions, enlarged lymph nodes (P = 0.068) and other features. Regardless of the tumor size, 75% of PASC lesions present with central necrosis while 25% are purely solid. Small PASC lesions can be associated with lymph node metastasis at a relatively early stage. Large PASC lesions are likely to invade adjacent tissues and be associated with venous tumor thrombus formation. Yun‑Feng Feng and Jie‑Yu Chen are contributed equally to this work.